To fulfill this pledge, IMA first issued a code of conduct in the early 1980s that was designed to guide the ethical aspects of the business as well as the personal decisions of its members and their organizations. 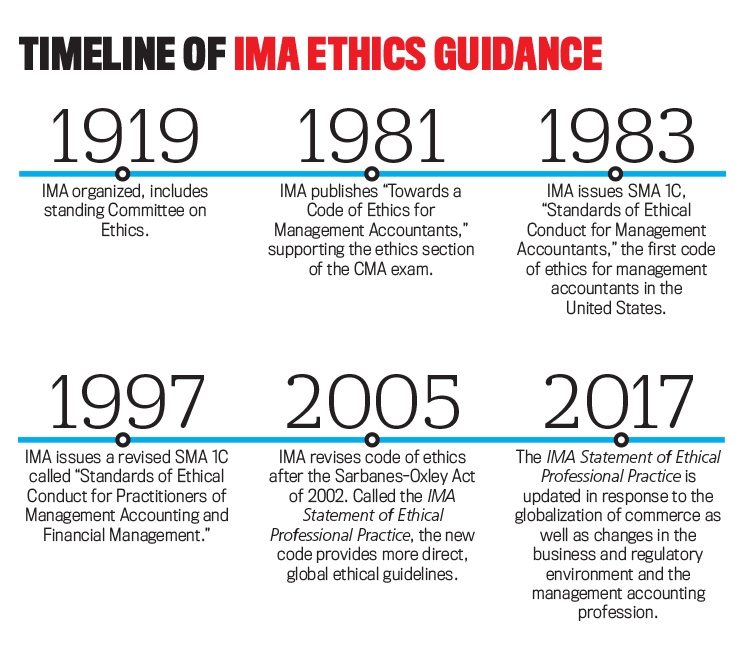 Over the years, IMA has updated its ethics guidance to meet changing conditions (see “Timeline of IMA Ethics Guidance”). Financial scandals in the beginning of the 21st Century led to publication in 2005 of the IMA Statement of Ethical Professional Practice, a more comprehensive guidance document with which members are required to comply as a condition of membership. After many changes in the business and regulatory environment since the Statement became effective—including the globalization of commerce and the management accounting profession—IMA determined to issue an updated version in 2017. This new Statement is the latest part of IMA’s strategy to advocate for the adoption, promotion, and execution of business practices that are consistent with the highest ethical standards. 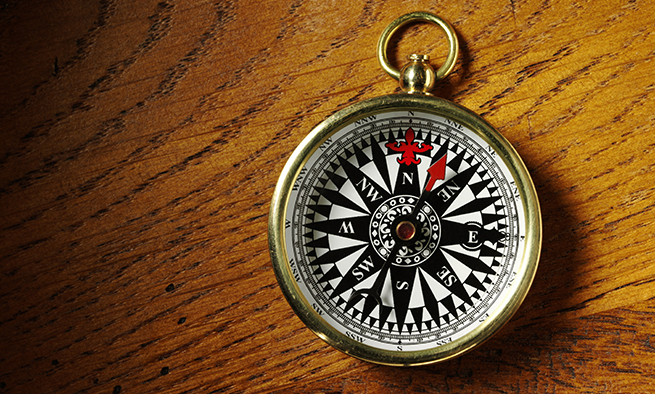 The newly issued guidance is the result of several years of research by the IMA Committee on Ethics (CoE), which studied and evaluated the ethics codes of other professional organizations as well as the global ethics standard for professional accountants issued by the International Ethics Standards Board for Accountants (IESBA). IMA is a member of IESBA’s umbrella organization, the International Federation of Accountants (IFAC), so the IMA Statement must be no less stringent than the IESBA Ethics Code. A subcommittee task force of the CoE undertook the first phase of the revision process: the study and evaluation of other codes of conduct. It developed initial concepts for modifications of the existing Statement that were then thrashed out in both telephone and face-to-face debates and through extensive deliberation by the entire CoE. The task force devoted particular thought to the whistleblower provisions of the Dodd-Frank Wall Street Reform and Consumer Protection Act. Language changes that triggered controversy were hammered out through compromise. The CoE submitted the revised document to the IMA Global Governance Committee, which approved it with only minor modifications. 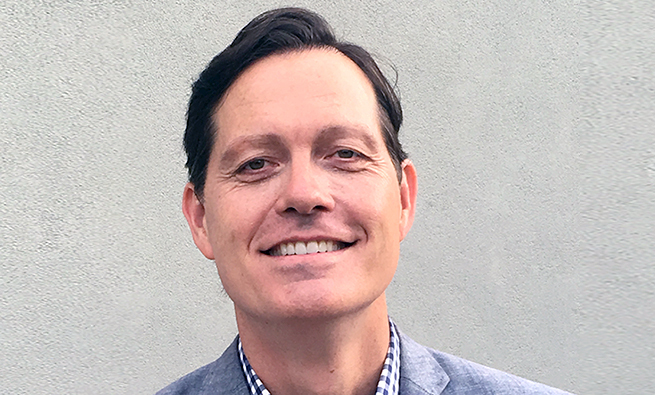 The final approval by the IMA Global Board of Directors was unanimous. The new Statement retains the general format and much of the language of the previous version, but it’s shorter and easier to apply. The previous version’s detailed and expansive section on dealing with and resolving ethical issues has been reduced in order to provide greater emphasis on the Standards section. The document retains a focus on ethical values and principles rather than formalization of prescriptive, precise, and legalistic rules. It encourages professional judgment, challenging members to demonstrate ethical behavior in every aspect of their lives. It also is aspirational, suggesting members should encourage others within their organizations to follow its provisions. 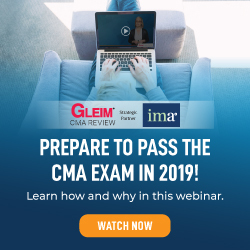 Although the new Statement became official upon its approval by the IMA Global Board of Directors, its subject matter won’t be tested on the CMA® (Certified Management Accountant) and the CSCA™ (Certified in Strategy and Competitive Analysis) examinations until test preparation providers can make necessary changes in their materials. The new Statement is also issued as an IMA Statement on Management Accounting (SMA), part of a series of research and guidance documents that address best practices for management accounting professionals—not just IMA members and CMAs. The new Statement is also being incorporated into the content of IMA professional ethics courses. 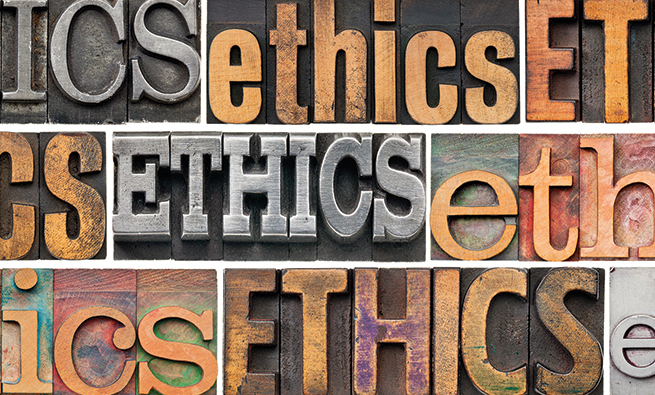 IMA’s overarching core ethical principles are honesty, fairness, objectivity, and responsibility. In addition to performing their own employment responsibilities in accordance with the IMA principles and standards, members should encourage others within their organizations to adhere to them. The need for behaving ethically also applies to all activities IMA members engage in, not just their actions as management accountants and financial managers. This means that members should embody the IMA principles in their actions outside their workplace, which includes their dealings with others in their community. Honesty requires conscientious application to the task at hand and truthfulness in all analyses and communication outcomes. Fairness requires just and empathetic consideration of the needs of others when making decisions in a particular situation, as well as full disclosure of all necessary contextual information. Objectivity requires impartial, dispassionate consideration and evaluation of conflicting points of view before arriving at an optimal conclusion. Responsibility requires all actions to be performed with faithfulness and loyalty. The overarching principles are intended to provide freestanding additional guidance to help members and other financial professionals consider the ethical values involved in the decisions they make. As a result, they aren’t applied in the same way as the areas of ethical responsibility that are set forth in the Standards section. Adherence to the principles is voluntary, and noncompliance doesn’t subject members to potential discipline. Unlike the overarching principles, which are aspirational and general in nature, the standards set forth four areas of enforceable conduct that members must uphold and comply with. Failure to do so may result in disciplinary action. The four standards require the application of specific steps involving the qualities of competence, confidentiality, integrity, and credibility. Each IMA member has a responsibility to comply with all of the standards. Almost all of the requirements contained in the previous IMA Statement are carried forward to the new version. One exception is that the new competence standard adds the example of recognizing and helping to manage risk. This change acknowledges the increasing importance being placed on risk management and management accountants’ expanding responsibilities in this area. Another change is in the language of the new confidentiality standard. A phrase that might have mistakenly limited the scope of a management accountant’s confidentiality responsibilities to monitor only the compliance aspects of subordinates’ activities was deleted. The new version simply states the need to monitor the use of confidential information. The integrity standard adds new requirements for IMA members to contribute to a positive ethical culture in their organization and to place integrity of the profession above personal interests. These requirements, which comprise possibly the most significant change from the previous IMA Statement, recognize the need for members to personally take an active part in ensuring that their organization has a strong, open, and positive ethical culture rather than a weak one. Silent acceptance of unethical policies and procedures isn’t sufficient. The rest of the integrity standard is identical to the previous version. 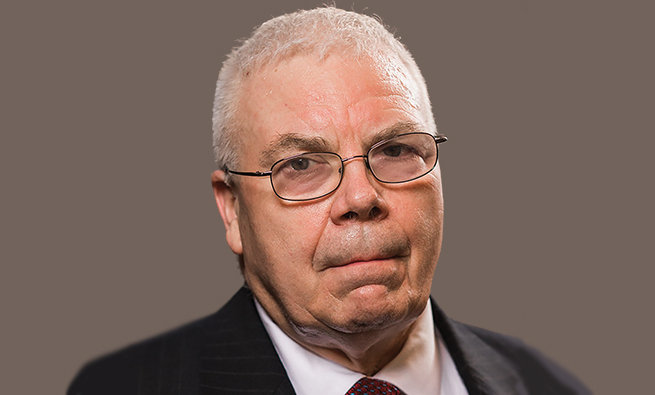 The new credibility standard now contains a requirement for communicating professional limitations or other constraints that would preclude responsible judgment or successful performance of an activity. Previously, this was in the competency standard. The IMA Statement is unique among professional codes of conduct in that it provides suggested action steps designed to help resolve ethical issues. It isn’t part of the Standards section that IMA members are required to follow but rather contains suggested actions that IMA members and other accounting professionals may take to resolve unethical matters they may encounter. 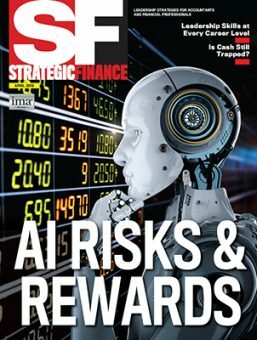 The section states that members and other management accountants should work toward a solution of ethical issues and not just stand by and ignore them—while considering all of the risks involved and whether there are protections against retaliation for those who report the existence of an ethical issue. Recommended actions include following the established policies of the employer organization, including use of an anonymous reporting system if available. Many organizations have developed policies and practices for dealing with and resolving ethical issues, and those policies and practices should be followed when they exist. If the organization doesn’t have established policies and practices, members and others should consider the following courses of action. First, the resolution process could include a discussion with the member’s immediate supervisor. If the supervisor appears to be involved, the issue could be presented to the next level of management. Studies show that employees are comfortable discussing workplace issues with their supervisor in most situations, and this is likely to be the first step in resolving many ethical issues. 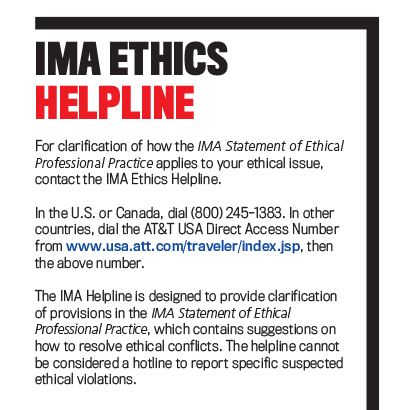 IMA offers an anonymous helpline that IMA members and other management accounting professionals can call to confidentially discuss how key elements of the IMA Statement could be applied to their ethical issue (see “IMA Ethics Helpline” below). To assist members and other professionals to best understand the legal context of their ethical issue, individuals should consider consulting their own attorney to learn about legal obligations, if any, as well as their rights and risks concerning the issue. They should expect the organization’s general counsel to represent the entity’s point of view rather than theirs. Finally, if resolution efforts aren’t successful, the individual involved may want to consider disassociating from the organization. This guidance appeared in IMA’s first code of conduct that was issued in the 1980s. Although it wasn’t included in the 2005 version, it returns in this new version. 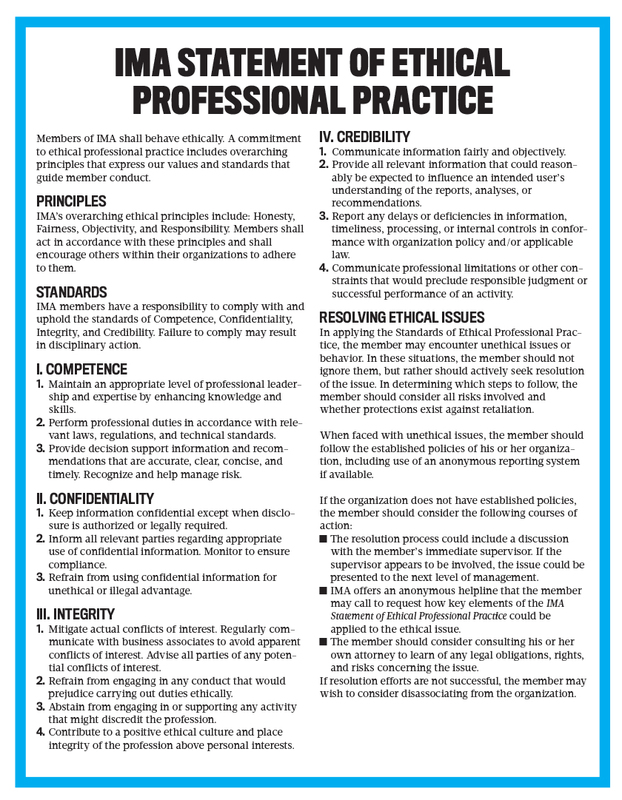 The revised IMA Statement of Ethical Professional Practice is a document IMA members can take pride in. They and other finance professionals can use it to form the basis of the ethics practices in their own organizations. Although a legal requirement to adopt a written code of conduct exists only for publicly held corporations in the United States, many private and not-for-profit organizations and other global entities have adopted portions of the IMA Statement as best business practices. I am very proud of IMA’s leadership in ethical professional practice. This update and alignment with international standards continues our commitment to leadership in the profession.